A practical painter meets a tortured fairy prince, and layers upon layers of magic and intrigue engulf them in this debut. In Regency-esque Whimsy, where time seems suspended and it’s always summer, humans practice Craft (making) for the pleasure of the capricious fair folk. Fair-skinned human Isobel, 17, is a portrait painter of unsurpassed talent who has mastered the art of wrangling practical enchantments from her clients. When she paints sorrow into the eyes of the autumn prince, she becomes embroiled in a complex web of fairy-court intrigues. Golden-brown, beautiful Rook (autumn and summer folk are darker skinned; spring and winter lighter) kidnaps her in retaliation; in their uncomfortable flight they fall for each other, dooming themselves to death. 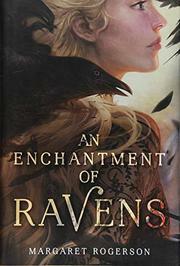 The occasionally busy first-person narration blossoms with unexpected humor (appealing-but-alien Rook consider tears “leaks”); rich, detailed descriptions of the beautiful but dangerous world of the folk will seduce readers, while the unexpectedly action-filled flight (there’s a wild hunt, a ball, magic battles, and extreme painting) keeps the pages turning. Rogerson draws on fairy lore while changing myriad details to suit her story, and in Isobel she provides a strong, confident heroine who may lose her heart but never her head.